There was hardly a dull moment during season 2013-14, which was full of unexpected drama and development, with a remarkable contrast in the club’s fortunes on the field and off it. Exactly 90 years after Vale competed in the inaugural season of the East of Scotland League, 2013 saw them take their place in another newly formed league as the Scottish Lowland Football League kicked off. Despite a good league campaign that saw them top of the table for a period, off the pitch there was a decline in committee members, with the club struggling to fill the office-bearer roles. Additionally, an early exit from the Scottish Cup coupled with a lack of local support for fund-raising events contributed to a financial crisis. A reshuffle in the dugout meant Chic McAleavy was now sole manager with Fraser Ogilvie as his assistant, while ex-Hibs legend Micky Weir joined the coaching staff. All of the players McAleavy had brought to the club towards the end of the previous season stayed on for the start of this one, but there were some departures as Kerr Dodds and Danny Noon joined the growing contingent of ex-Vale players at Whitehill Welfare. Defender Jack Blaikie signed for Spartans, Darran Thomson left for Preston Athletic and cousins Sinclair Inglis and Chris Inglis joined SJFA side Edinburgh United. McAleavy bolstered the squad with some excellent signings as he brought in midfielder Ross Aitchison, goalkeeper Bruce Callan and striker Scott Gormley, all of whom had previously played under him at Civil Service Strollers. Also arriving at Victoria Park was midfielder Scott McCulloch from Whitehill Welfare, former Tynecastle and Peebles Rovers keeper Graham O’Brien, defender Taylor Aitchison from Berwick Rangers, ex-Coldstream and Kelso United midfielder Keith Lough, another former Strollers player Danny Rennie, who had spent the previous season at SFL side Arbroath, while there was the welcome return of forward John Ferguson, most recently at Spartans, for a second spell at the club. As East of Scotland clubs prepared for the season ahead, the recent groundswell of support to bring Scottish football in line with most other European countries and implement a pyramid system offering ambitious clubs a route into the national league led to an SFA meeting in June when a unanimous vote saw the Scottish Lowland Football League being formed. A total of 27 clubs registered an initial interest, 17 of whom applied for the 12 places on offer in the new league and were selected on the basis of their existing facilities and willingness to work towards obtaining an SFA-standard license by May 2015 – a deadline which had long been known as the point clubs would no longer be able to compete in the Scottish Cup unless their grounds were up to the required standards set down by the SFA. To this end, Vale had spent the summer building an extension to the Victoria Park pavilion. When it had been built back in the 70s, teams were allowed a maximum of two substitutes and the referee tended to be the sole match official. With times having moved on, a revamp was well overdue and the new layout contained larger dressing rooms, separate treatment rooms, an additional shower room and a larger space for referees and their assistants. Three clubs – Preston Athletic, Spartans and Threave Rovers – had already obtained a license, so were automatic picks for the new league. Nine other clubs were selected by a process of ground inspections and recent playing records, until the participating clubs were announced as Dalbeattie Star and Threave from the South of Scotland League, East Kilbride representing the west of Scotland and East of Scotland clubs Edinburgh City, Gala Fairydean Rovers, Gretna 2008, Preston, Selkirk, Spartans, University of Stirling, Vale and Whitehill Welfare. It has to be said that the Lowland League was not without its critics. Barely seven weeks between conception and kick off, the announcement had caught many clubs on the hop and there were no applications from any of the well-supported Scottish Junior FA clubs, which would have given much credibility to the idea of an elite division of non-league teams. Furthermore, the concentration of teams who either did or had formerly played in the East of Scotland League made it look like little more than a glorified version of that league with the addition of East Kilbride who, despite a strong youth set-up, had only previously played adult football at amateur level. The inaugural season would feature no promotion or relegation, but the Lowland League were thinking ahead and establishing a strong league in central and southern Scotland was the first step in affecting a transition to a pyramid system in the future. The new league also attracted a high-profile sponsor in the shape of tabloid newspaper The Scottish Sun and on Saturday August 10th 2013, amid much fanfare and ceremony, that first step was taken. A historic day at Victoria Park as the Scottish Lowland League kicks off. Vale captain Jim Young is pictured before kick off with Gretna captain David Renyard, match referee Stephen Allan and assistant referees Steven Rintoul and Roumen Radev. Vale had arranged a packed pre-season schedule featuring some strong opposition and it was a mixed bag in terms of results with wins against Sauchie, Berwick Rangers Reserves and Dalkeith Thistle. But defeats against a Hibernian XI, Tollcross Thistle, Penicuik Athletic and Edinburgh United saw encouraging performances and the team gelling together well, giving rise to hopes that Vale would make their mark in the new league. The opening match took place at home against Gretna 2008. Nothing seemed to go right for Gretna as they suffered the loss of their goalkeeper to injury and had Daniel Bulmer red-carded for a challenge on Scott Gormley in the area. Gormley scored the resulting penalty and Vale sealed the points shortly afterwards as Stewart O’Neil netted, despite appeals for offside from Gretna. It was the start of a fantastic month for Vale, who collected 14 out of 18 available points during August, drawing with Spartans and Whitehill Welfare either side of wins against Preston Athletic, Gala Fairydean Rovers and East Kilbride and August ended with the Inerleithen men sitting four points clear at the top of the table. Vale have suffered some painful Scottish Cup exits over the years but surely none more painful than when the draw paired them away to Brora Rangers. A goal in injury time from Steven Mackay won the tie, but Vale’s feat in holding the Highland League leaders until the dying seconds was all the more remarkable given that they were down to nine men by half time after Jim Young was red-carded when he was adjudged to have used his elbow when challenging for a high ball with Zander Sutherland. A few minutes before half time John Ross Kerr joined the captain in the dressing room after he picked up two yellow cards in the space of as many minutes. The second half saw Vale matching the hosts stride for stride, but they received another blow when Scott Gormley was penalised for a foul on Gavin Morrison. Referee Craig Sim looked set to merely caution the Vale subsitute but, after being surrounded by a group of Brora players, seemed to change his mind and produced red. Vale manager Chic McAleavy was next in the official’s sights as he was sent from the dugout for protesting the decision, and in the immediate aftermath of MacKay’s winner Eddie Mearns became the fourth player to be shown red for dissent. Despite this, Vale could still leave Scotland’s premier cup competition with their heads held high after a brave performance with so many factors stacked against them. Vale lost their unbeaten league record as Edinburgh City left Innerleithen with all three points and then fell from their position at the top of the table as they were beaten 4-1 by University of Stirling at Forthbank Stadium, but regained it the following week thanks to a 3-1 win over Selkirk. Unfortunately this game proved to be the last to feature striker Scott Moffat, the club’s top scorer in the previous three seasons. The arrival of the new players in forward positions had seen him mainly on the bench or played out of position and he decided to move to Lothian Thistle Hutchison Vale for regular football. A popular figure with supporters for his hard work, vital goals and good attitude to playing the game, many were sad to see him go. One person arriving back at Victoria Park though, was former player and manager Jack Diamond. Vale had been without a chairman since the departure of Ken Brown, with vice-chairman Andy Scott filling the role by default. But Diamond agreed to head the committee and set about assessing the structure of the club. Action from the Lowland League Cup as Gala captain and ex-Vale favourite Sean Paliczka tries to find a way between two Vale players at Netherdale (photo: Rob Gray), while John Ross Kerr tries to escape the attentions of Selkirk’s French signing Benjamin Huteau at Yarrow Park. The third rounds of both the Image Printers and South Region Challenge Cups saw Vale travel to Ainslie Park to meet Spartans. There was to be no joy on either occasion, Spartans following up their 4-0 Image Printers success with a 4-1 win in the South Region Cup, the latter being the only game Vale managed during February as the weather once again affected the fixture list. Vale went three points clear at the top of their League Cup group with a win at Selkirk, but losses in the last three games against Preston Athletic (twice) and a Gala Fairydean Rovers saw Vale overtaken by Preston. The final cup competition of the season saw Edinburgh University the visitors to Victoria Park in the King Cup, but Vale appeared to underestimate their East of Scotland Premier Division opponents, who left with a place in the next round after a 2-0 victory. In the week following the King Cup tie, the club was saddened by news of likeable vice-chairman Andy Scott (left) passing away at home in the early hours of 19th March, aged 77. It brought to an end two decades of involvement with the club, in which he was a familiar face to many who visited Victoria Park. A huge gathering at Melrose crematorium the following week, payed tribute to his standing, not just at Vale, but in the wider community of Innerleithen. Despite a generally poor showing in the cup competitions and the departure of key players Charlie Brigain and Scott McCulloch to Penicuik Athletic, Vale continued to pick up points in the Lowland League and went in to the final month of the season as the only team who could mathematically catch leaders Spartans. A 2-0 defeat at home to Whitehill Welfare ended the unlikely title challenge and a home and away double header against Dalbeattie Star, which resulted in a win at Victoria Park and a defeat at Islecroft Stadium four days later put paid to the chances of finishing second. 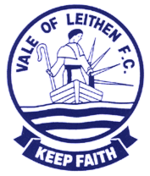 The tensions that had built up between the committee and team management came to a head in the week following the defeat in Dalbeattie, resulting in the entire management team sensationally quitting on the eve of the club’s final home match of the season. In a repeat of what had happened at Civil Service Strollers the season before, McAleavy was immediately followed out the door by the majority of the squad. Only half a dozen players – Ross Aitchison, Taylor Aitchison, John Ferguson, Keith Lough, Ryan McKenzie and Graham O’Brien – elected to stay on and were supplemented in the final two games of the season by a collection of trialists. A hurriedly thrown together side, overseen by chairman Jack Diamond, ran University of Stirling surprisingly close at Victoria Park, but the following week’s season closer at Meadowbank, with former manager Stuart Robertson in the dugout, another patchwork side were unceremoniously taken apart by Edinburgh City. Unfortunately it later emerged that Vale had fielded more than the permitted amount of trialists in the final two matches and the club were subsequently docked six points from their season’s total, pushing them down into the bottom half of the table. A few days after the season ended, Vale announced Mark Lamb as their manager for next season. * Vale of Leithen deducted 6 points for fielding more than the permitted number of trialists in their final two games.